So you want to host a dinner party, but you’re standing in the supermarket realizing steak for 10 people costs as much as one week of college tuition. Turning your gaze in shame, you discover steaks whose price point is in the single digits. Congratulations, you’ve discovered the cuts the pros pick. But you have to put the work in. Here are some great ways for you to prop up the pillars of flavor: taste, texture, temperature, and tenderness. Let’s start with your prep work. The harder a muscle works in life, the more flavor it tends to acquire, even as it gets tougher to eat. 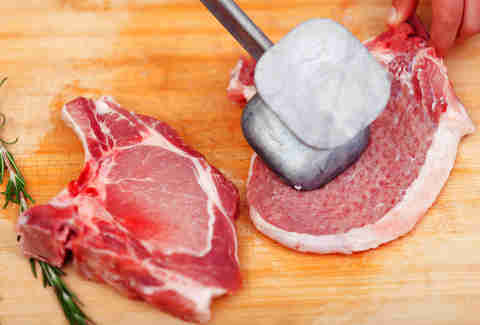 Pound a fillet with a meat mallet to save your guests’ jaws some work. Playing the meat drums isn’t just fun, it’s essential for cuts like skirt, flank, and flap. First, crush a clove of garlic to release its oils, and rub it all over the steak. Then tuck the crushed clove into or under some corner of the cutlet (you can also roll it up in thinner cuts), which will help your cut soak up that garlic flavor. If you have a sprig of fresh rosemary, give it a good smack in your hands to release its oils, then repeat the process from the garlic. 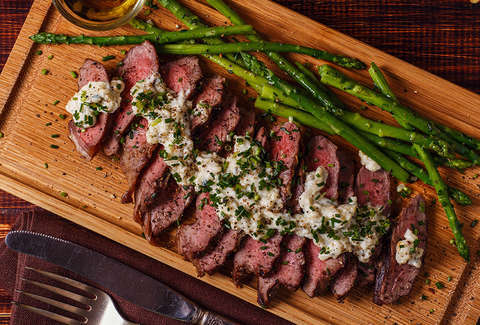 Pro tip: You can also stow your garlic and rosemary under the steak on the grill, or throw it directly on the coals to strengthen its flavor before returning it to the steak. Seasonings can’t penetrate meat very deeply, so when you dry rub in advance, you give them more time to anchor their flavor stronger on the surface rather than deeper into the meat. To hurry it up a bit, adding salt in the rub will lock them in faster, if not farther. Of course, you should be salting your steaks enough anyway to tenderize them and trap moisture, so add enough salt to make that rub do double duty as a dry brine. Three or four grams of salt per pound of meat should brine just fine. Sugar lacks salt’s miraculous talents, but dust it on the outside and it helps the proteins form a Maillard crust. Also, sugar will hit your guests smack in their brain’s reward center (called the VTA, if you’re wondering). Feels kind of like a cheat, which is why it’s perfect for this article. This is the definitive method for putting bargain protein on par with restaurant fare. Tough steaks turn into brilliant eating if cooked low enough and long enough. An immersion circulator (the actual name for what people just call “the sous vide machine”) holds them at the perfect temperature and moisture until cartilage, fat, and stronger muscle have all broken down. These days, circulators cost the same as a single high-end steak dinner, so you’ll recoup the cost of a new machine immediately. For most every marinade, there’s a reason not to let steak soak in it too long. Acids brighten up taste, but tighten up muscle. However, there’s good news: Beef withstands this pretty well, so for chewy cuts like top round, flank, or skirt, use an enzymatic acid like fresh pineapple juice. But be fast: Enzymes can soon make food mushy. But why not get weird? Try a dairy like buttermilk or yogurt, which gently tenderizes. 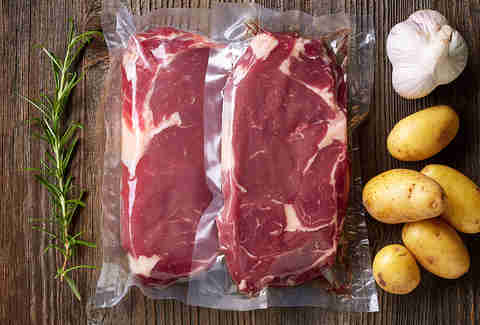 Or, if you want a boozy marinade, fatty cuts absorb it best, and can stay juicy even as alcohol dehydrates the meat. And if you have a bland cut like chuck eye, bathe it in soy sauce for some umami goodness. In all cases, a couple hours should suffice. Stir-fry is a great use for thin steak, since it saves some slicing and the juiciness isn’t a factor. Mix up egg whites or baking soda in water, along with cornstarch and water to make a thin coating, and hey, try a little soy sauce for yum factor (but not so much it cancels the pH). A splash of alcohol here is good, too. Other than mezcal, this tastes great with just about every booze under the sun. In the old days, people made confit as a means of preservation, but in 2018, your friends are going to look at you like the 1% when you serve them a steak cooked under fat at very low temperatures. It’s the precision of sous vide plus the clout of eating like an ancient lord. Salt and season your steak (substitute garlic salt for cloves to avoid risk of botulism), and put it in a small container where it fills as much space as possible. Cover in an oil, ideally one that hardens at lower temperatures, and cook at your oven’s lowest setting (probably 150º F) for as long as you want (it’s impossible to overcook). Let cool to room temperature, and when ready to serve, pull it out for a quick pan sear. After your guests eat it, reveal it’s been stored on the counter for a week. If that steak’s bland, do what chicken dishes like cordon bleu or Kiev do: Drop a flavor grenade in it. Wrap it up with twine or hold it closed with toothpicks around a filling of aromatics, herbs, cheese, butter, veggies, and even other meats. 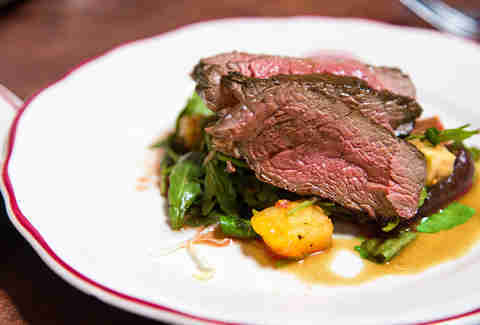 Cook on low to medium heat, and the steak will absorb the taste explosion of its fillings. Fire in the hole! This feels like a cheat, but every restaurant does it, so what the hey. 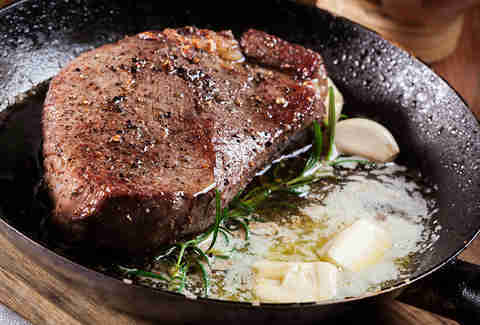 After your steak’s cooked, brown some butter in a cast-iron skillet, toss the chop in there to sear, and keep spooning the melted butter all over it. It’s a ridiculously underrated way to make any dish more complex in your mouth. Acids too early on can end up ineffectual, or worse, cook up to a metallic taste, in my opinion. But right before serving, a little lemon juice or apple cider vinegar is like a slap in the face to wake up lazy dishes. For a steak, a hearty splash of malt vinegar or red wine is an even better way to go. You pulled that steak off, let it rest, and it’s still not savory? You still have time before it cools to cover it with some blue cheese and/or toss mushrooms in a pan and pass off their umami as the steak’s own. Bonus: Those mushrooms are going to continue to release water, which might gussy up the steak if it’s too dry by nature or overcooking.